Whitney Orthodontics in Sugar Hill treats patients of all ages. Treatment never has been more comfortable and effective for adults than it is today, thanks to numerous technological advancements in the types of appliances we use. You’re never too old to improve your smile, and healthy teeth can be improved at any age. Orthodontic treatment in adults is increasing in popularity, and the American Association of Orthodontists has statistics to prove it. They report that one in five orthodontic patients today is an adult. There are many reasons why more adults seek orthodontic treatment these days. Among them is aesthetics – there are so many types of braces available now that are virtually invisible, adults seem to feel less self-conscious about enduring treatment. The aesthetic options offered in our office include Invisalign®, a system that uses clear aligners, and Clarity, a system that uses clear brackets. 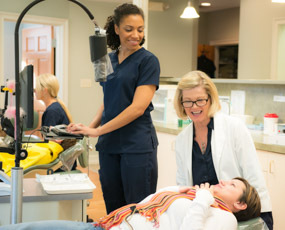 Another reason adults clamor for treatment is because we can align teeth faster than ever, thanks again to technology. Options such as Clarity and other types of self-ligating braces that reduce friction in your mouth and allow your teeth to move more freely with less applied force. A healthy bite and teeth that are in proper alignment make it possible for you to keep your teeth and gums healthier. A proper bite prevents premature, abnormal wear on your teeth, while aligned teeth prevent crowded spaces where food particles can gather and cause decay. Please call us today if you’re interested in learning how orthodontic treatment can improve your oral health.